The Sneaker Hall Of Fame is FashionBeans’ compendium of the most iconic trainer designs of all time. From the Common Projects Achilles to the Nike Air Force One, these are the kicks that have changed the course of footwear history. The plain white sneaker is more than just a shoe rack staple, it’s a bona fide style essential. No man – or woman, for that matter – should be without a pair. And when it comes to choosing, there’s certainly no shortage of options. 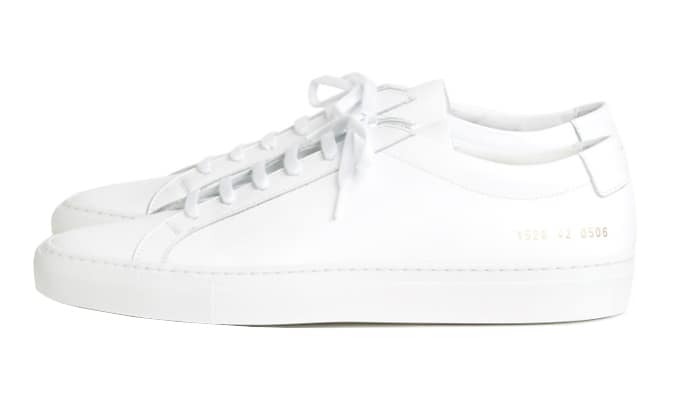 Adidas and Converse are two of the big names that immediately spring to mind, but even among such stiff competition, there’s one brand, and one shoe in particular, that stands out: the Common Projects Achilles Low. Having only been on the scene since 2004, the Achilles may not have the century-spanning heritage of Converse high-tops, nor the sporting pedigree of the Stan Smith, but with its buttery Italian-leather construction and streamlined silhouette, it has successfully set the benchmark for all other minimal sneakers to aspire to. Here we delve into the details behind every stylish man’s stripped-back sneaker of choice and look at what makes the Achilles Low a modern classic. Magazine art director Peter Poopat and footwear brand consultant Flavio Girolami became friends after repeatedly bumping into one another around the fashion scene in New York City. The two began meeting up after work from time to time and often discussed their frustration at not being able to find the right clothes or footwear to suit their select tastes. While living in different countries, Poopat and Girolami began working on a number of ventures together – or ‘common projects’ – one of which involved creating the perfect sneaker. The mission was simple: to design a pared-back white leather shoe that combined the casual appeal of a sneaker with the high-end build quality and premium materials more commonly found in luxury Italian casual dress shoes. This footwear hybrid became the Achilles Low – Common Projects’ first and, at the time, only model. 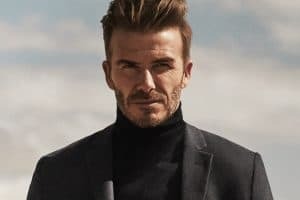 It launched in 2004 and retailed for $265 (£200) – a number that while seemingly steep, was actually a loss when materials and other costs were taken into account. Irrespective of the price, which later had to be ramped up further still, the Achilles Low quickly became the iPhone of the sneaker world. These minimalist marvels soon lined both the front row at fashion weeks around the world and the shelves of all the most respected retailers, thus cementing their place as one of menswear’s most coveted items. What Common Projects achieved with the Achilles Low was to effectively reinvent the wheel. Poopat and Girolami took the simplest of things and made it exciting and desirable through their unconventional approach to design and manufacture. The Achilles’ allure lies in its sleek silhouette, luxurious artisan construction and, of course, its masterful restraint. The attention to detail is typified by the shoe’s iconic gold branding to the heel – ten shimmering numbers denoting the size, style and colour of each shoe that have become every bit as emblematic as Nike’s swoosh or Adidas’ three stripes. At its core, this is a sneaker with the DNA of a dress shoe. Each pair is handmade at a small factory in Italy’s Marche region, which until Common Projects came along had never dealt in anything other than formal footwear like Oxfords or Derbies. The label’s marketing strategy, or lack thereof, only added to the appeal. Common Projects has never advertised. Nor has it hosted a party, pop-up space or press day. The label lets the shoes, and the shoes alone, do the talking. The product was so good that the hype simply created itself. Now at over £300 a pair, it’s fair to say the Achilles isn’t the most affordable sneaker on the market, but its boundless versatility makes it a solid style investment if you have the budget to cope. It’s a shoe that will complement anything from tailoring to shorts and a Cuban collar shirt, but for a classic look, pair it with similarly stripped-back garments. Classic slim-fit jeans and a crew neck jumper layered with a white T-shirt is a surefire winner every time. If you are looking to mix up your suit game though, a pair of Achilles is the perfect accompaniment. The very fact they’re sneakers will instantly dress your tailoring down, but the shoe’s premium build quality and stripped back design ensures they remain smart enough for anything you throw at them.